After a year of service, Caitlin Barbour, our current VISTA, will be completing her term on March 18th. She has spent the last year working on getting the Partnership reorganized, planning Congreso 2019, and building a platform for the next VISTA. During this year as an AmeriCorps VISTA, she has been rewarded with the experience of working in a professional setting, expanding her skillsets and knowledge, and has been exposed to more cultures and communities than she would have otherwise been able to experience. Some of her most memorable moments include exploring the local outdoors, being able to visit multiple parts of New Mexico and Colorado through traveling for presentations & workshops, and meeting so many new people from different backgrounds. The biggest challenge she faced was becoming familiar with the area quickly enough, especially as she is the first VISTA to come from out of state. Another factor of this was living in a rural area as the majority of her life has been spent in urban or semi-urban locations. With the experiences and fun that she's had during this past year, the AmeriCorps VISTA experience is definitely something that Caitlin would recommend. Whether somebody is needing a foot in the door with experience, unsure if a certain career field is for them, or somebody taking a gap year, her experience as a VISTA is something that she will always remember and be grateful for. Recently, the Partnership sponsors applied for another three-year VISTA project and were approved! This project will have a large focus on education and outreach and will also be working more closely with the Partnership than the previous project. Our next AmeriCorps VISTA Volunteer, Jared Daniels, will begin serving as VISTA in April. Thank you to Caitlin for her service and best wishes for the next adventure! 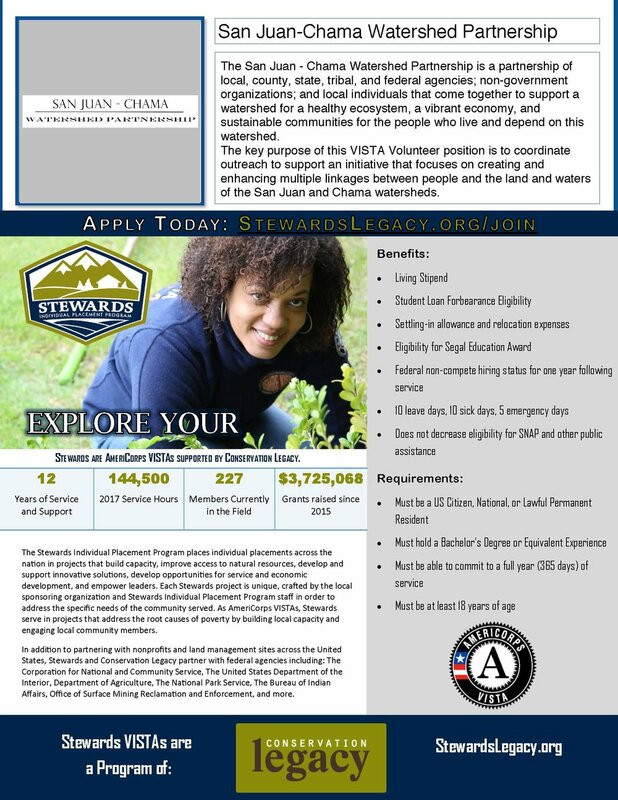 If you’d like to reach out to Caitlin and thank her for her year of service or ask questions about AmeriCorps and VISTA you can email her until March 18th. Learn more about the VISTA position. Join us March 14th from 5 - 7 pm for a going-away gathering for Caitlin in Chama! Light pizza and drink refreshements will be served; please bring a dish to pass. RVSP to Emily for directions (email or 888-445-7708 ext. 1). Did you know that CPA offers scholarships to graduating high school seniors at Escalante and Pagosa Springs High Schools? 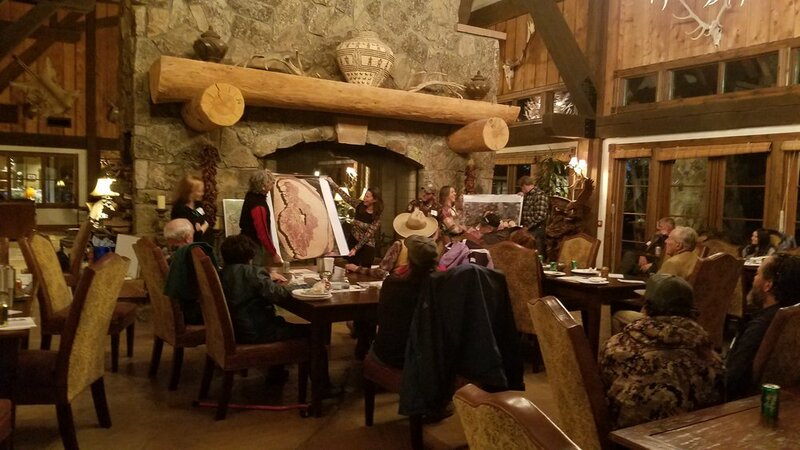 These scholarships support advanced studies at any college, university, or technical college and are sponsored by 262 Ranches, of Tierra Amarila, New Mexico, and donors like you! Students do not need to be majoring in conservation or the biological sciences, but must write an essay describing why private land conservation is meaningful to them. First place awards of $1,000 and runner-up awards of $500 are given to as many students as our fund can support in a given year. Application materials are available through each school's counselor's office during the winter semester of each school year (pst…materials are available NOW!). Interested in donating to support this scholarship fund? We’d LOVE to add your support for these amazing students! Click here to donate online or send a check made out to “Chama Peak Land Alliance” to PO Box 5701, Pagosa Springs, CO 81147. Make sure to indicate your donation is for the scholarship fund. Read about the exceptional students that received scholarships in 2018 here. Please join us on April 23rd from 6-8 pm at the Chama Senior Center (next to Lowe’s grocery store) for an informative presentation from Tom Watts, Southwest Wildlife Services. Tom will provide an overview of his report "Mule Deer and Elk Status Report for the San Juan/Chama Basin: 2014-2016 Update" covering population trends of these two species. Tom will also discuss steps landowners can take to support big game populations in our region. Please join us for our 2019 Winter Social! We will have food, networking, and an informative speaker on Environmental Education! All CPLA members, neighbors, and friends are invited—open to all! This is a great opportunity to meet other members, landowners and managers, and hear about the exciting projects and events we have planned for 2019. Speaker: Claudia Reynoso, science teacher at Escalante High School and CPLA Board Member, will speak about her efforts to engage students with hands-on science learning in and outside the classroom! February 1, 2019 at 5:30 pm to 8:00 pm at the Upper Chama Soil and Water Conservation District office in Tierra Amarilla (across from the Post Office). Having fun during a forest health presentation by Mary Stuever at the 2018 Winter Social. Have you ever considered using prescribed fire - also called controlled burning - as a land management tool on property you own or manage? Are you curious about why fire is an important management tool, what the process is, or what resources are available for private lands? If so, then please join us on Friday, January 25th for a workshop on prescribed fire on private lands in Chama, NM. We will cover a broad range of topics applicable to private lands, with a focus on the nuts and bolts of implementation from planning to burn day. We will also discuss permitting, state laws, liability and risk management. 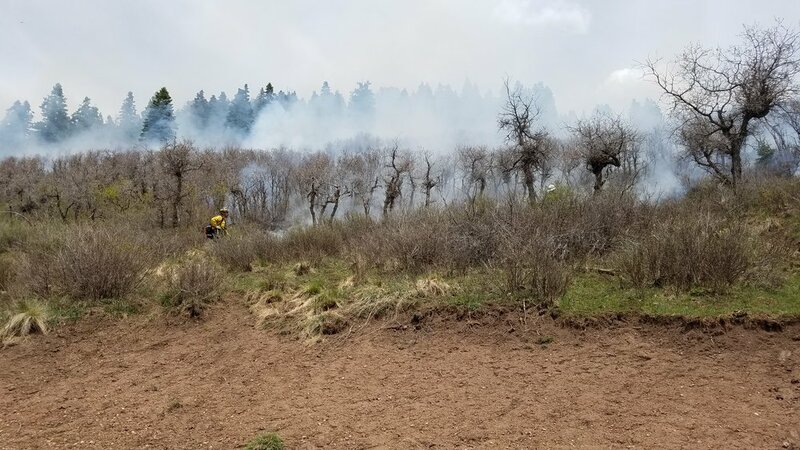 Landowners and managers will come away with clear next steps and an understanding of the process required to take full advantage of resources for prescribed fire that are available right now in our region! Early planning is important in order to implement a burn when environmental conditions are right, so please join us this month for this important discussion! This free workshop is sponsored and led by the Chama Peak Land Alliance with support from our partners at the Forest Stewards Guild and The Nature Conservancy’s Fire Learning Network. Friday, January 25, 2019 from 9 am to 4 pm at the Chama Senior Center next to Lowe’s grocery store in Chama, NM. Light lunch provided. No RSVP necessary. 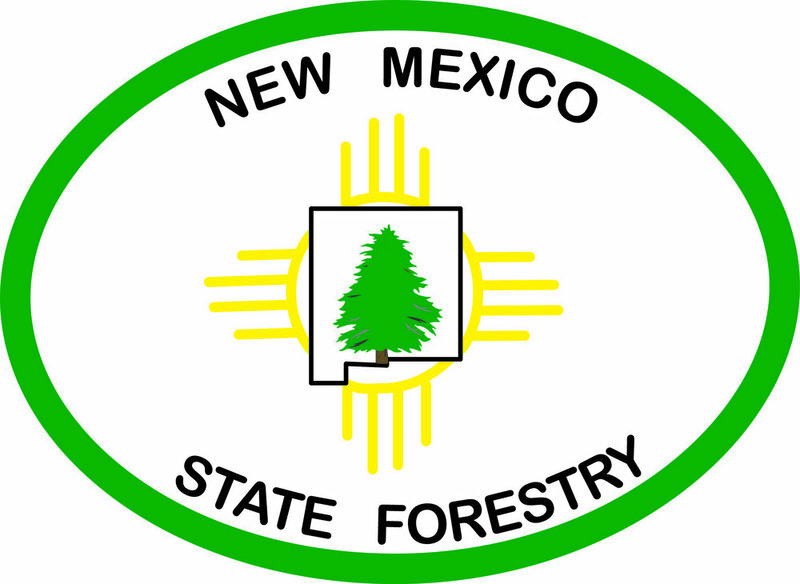 Low intensity prescribed fire for habitat improvement on private land near Chama, NM.